ORMOND BEACH -- Marie Sciacca-Max is a woman with a lot of patience and perseverance. She is on a faith-based mission through her nonprofit, Watching Over You Inc., to help homeless families struggling to break a cycle of poverty. More than 11 years ago, she opened the Community Thrift Boutique in Ormond Beach and began setting aside the shop's receipts, waiting for the moment when Watching Over You could buy and refurbish its first house to shelter a homeless family. 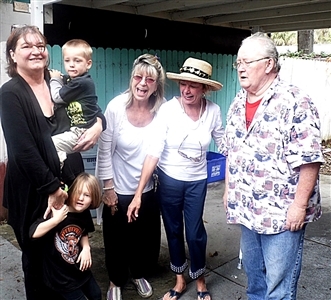 Debra Young, left, holds her two grandchildren as she receives keys to a home from Marie Sciacca-Max, center, Maureen Dalton and David Max, far right, of Watching Over You Inc. and Community Thrift Boutique. Photo from Halifax Urban Ministries. "I wanted to do something for the community locally," says Sciacca-Max, who is a member of Riverview UMC, Ormond Beach. "Community Thrift Boutique was the catalyst for Watching Over You. It just evolved. It's almost like I had a vision. I walk with God. I don't do anything without asking Him. " A few days before Thanksgiving, the house became a home for Debra Young, 52, and her two grandchildren: Angel, 4, and Derek, 3. They had spent two months in a Daytona Beach shelter operated by the nonprofit Halifax Urban Ministries (HUM), a United Way agency and an outreach ministry of the Florida Conference. Over the next six months, and possibly as long as a year, Young's family can live rent-free before the house gets passed on to the next homeless family in need. Groceries and a Christmas tree for the holidays were donated as well. Anything they need, Sciacca-Max says, they just have to call. "I think it's awesome," Young says. "We're blessed to be the first family to move in." Young says she struggled to provide for her grandchildren on wages from a part-time job. But she got behind on bills, especially her rent, and the family was evicted. "There are a lot of people there," Young says. "But it was there when I needed it, so it was great." The Young family is one of 335 to move out of the HUM shelter and into permanent housing since the nonprofit began operating the shelter seven years ago, says HUM spokesperson Mark Geallis. The families are tracked for at least six months, and more than 80 percent remain self-supporting through that period. HUM plans to hire a housing specialist to help improve those success stories even more, Geallis says. The HUM shelter is open to homeless families and has a maximum capacity of 94 people. They can stay for up to six months provided they are looking for work, stay drug-free and do chores such as taking out the trash or sweeping the floor. Families are assigned case managers. Though Young is no longer at the shelter, she is being followed by a case manager, says Rich Fitzmaurice, HUM shelter manager. "There are a lot of homeless people out there," he says. The shelter fields between 20 and 55 calls a month from families seeking help. Sciacca-Max reached out to the HUM shelter after contacting a local homeless coalition group. "We're really excited about it," Fitzmaurice says. "I drove away (on move-in day) in tears." Saving for the future is Young's goal. She now has a full-time job with a company that installs bathrooms for people with handicaps. The family rises before dawn to catch a 6:30 a.m. bus. Young drops Angel and Derek at day care and heads to work. "It makes for a long day," she says. "But I've never had help like this before to get back on my feet. This will help me put money away for rainy days." On the first day at the new home, Angel got a surprise - a four-poster bed in her own bedroom. "She jumped on the bed and oh, my God. It was just wonderful," Sciacca-Max says. "It was just a very happy moment in her life, something she'll never forget." Sciacca-Max hopes eventually that Watching Over You has five or more houses for homeless families. She is particular when it comes to closing a house deal, though. She wants a good neighborhood. "I don't want a home in a blighted area," she says. "I want to show children there is a better life, to see there is a place that is better than (what) they are coming out of." The first house is a three-bedroom bank foreclosure that cost about $42,000. Another $30,000 was spent on renovations, new furniture and new appliances. "The bones of the house were there," Sciacca-Max says. "But it looked like a war zone." All of the money came from thrift shop sales and donations. The shop is operated by volunteers. "We wanted no government funding," Sciacca-Max says. "Everything is generated from the community, from the store. Everyone who works here is faith-based. We have so many from the Christian community who come in here and they pray over us." Sciacca-Max says she has her eye on a couple more houses that might work out. She is just waiting on the money to build up again. And she'll go back to the HUM shelter to reach out to another homeless family.